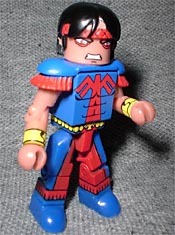 One of the most successful new figure lines of 2003 was Art Asylum's Marvel Minimates. 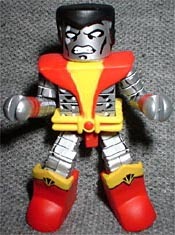 While the original, 3" Minimates did admirably for themselves, they never reached the market saturation nor the wild popularity of their new 2" cousins; of course, part of that was that the new figures were the first block-style figures of the kings of comicbook merchandising, Marvel Comics. The first series of figures were drawn from Marvel's most recognizable heroes: that is, the ones that had (or would soon have) big blockbuster movies to their credit: Daredevil, Hulk, Spider-Man and, of course, the X-Men. 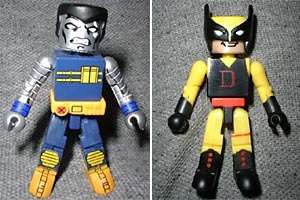 In order to seem more like their movie counterparts, the X-Men Minimates were drawn from the Ultimate X-Men comic, which was nice enough, but a lot of fans wanted the "classic" versions. Well, it doesn't get much more classic than 1975's Giant-Size X-Men #1. Though it may seem unbeliveable today, X-Men was almost cancelled in the late '60s - fans just weren't interested. 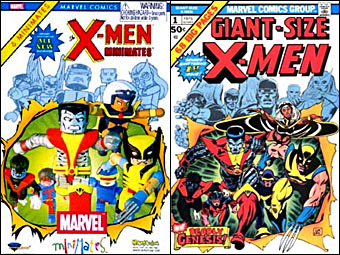 The comic had degenerated into just reprinting old stories until the all-new, all-different team of international mutants came along. Actually, that oft-cited "all-new, all-different" tag is misleading: out of the eight-member team, only half were new creations; the rest were all recycled, and two of them didn't even make it onto the cover of the issue. So let it be known: Banshee and Sunfire? Losers. The team captain was old workhorse Cyclops. Not only was he not a new character, he was actually the founding member of the X-Men. We've already had two Cyclopes in the Minimate line, the normal version and a maskless chase figure, but this one is entirely different. 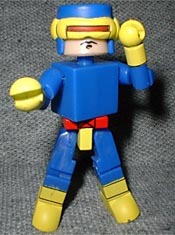 He's wearing his classic bright blue and yellow costume, complete with the red X-emblem belt. His mask and visor are removable to reveal the stoic look and red eyes that you'd expect from this high-powered stick in the mud. The only real diversity on the new team came in the form of weather goddess Storm - like the Bush White House, they struck the minority jackpot by hiring a token black woman. 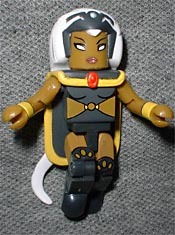 Ultimate Storm was already seen with the Minimates, but this is an older version of Ororo Munroe. She's wearing the distinctive black costume designed for her by Dave Cockrum, including the cape and headdress. Her white hair reaches down almost to the ground, and her eyes are blank white, suggesting she's in the midst of using her powers. Storm was originally going to be a character called the Black Cat, and she would change into a sort of humanoid tabby - by the time the project got off the ground, she was given white hair, a cape and a completely revised set of powers. Colossus began life as the average "strong, silent type who's really a big softie." He eventually grew into one of the X-Men's best characters, but he was pretty much a big dope in that first issue. His Minimate is all armored up, of course, showing off his great metal paintjob. Art Asylum is smart enough not to make vac-metallized Minimates, instead using silver, black and white to create the right effect. Few folks realize that when Colossus reverted to his human form, his costume had a lot more material - his thighs, exposed as metal, were covered in blue when he changed in order to keep him decent. If you thought Colossus was stereotypical as a communist farm worker, then you haven't seen anything yet. 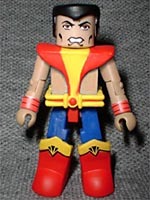 Meet Thunderbird, the angry reservation-dwelling Indian. John Proudstar was an Apache who was incredibly strong and fast and spouted such wonderfully nuanced dialogue as, "You can stuff a cactus, Custer! The White Man needs me? That's tough! I owe him nothing but the grief he's given my people!" and "I just hope you're not leading me into another Little Big Horn!" I guess we can consider it a small victory that he didn't greet everyone with a hearty "How, paleface" while sucking down whiskey. His red and blue costume is captured nicely, though his red mask looks more like bags under his eyes. The shade of his skin is very good, subtly darker than the whiteys'. The demonic Nightcrawler was the first new mutant introduced in the book, escaping from an angry crowd carrying pitchforks and torches. His distinctive red, black and white costume looks great in Minimate form. 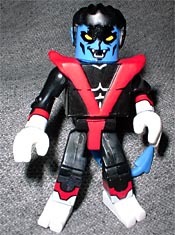 A separate piece fits over his torso to create the big red V, and his pointy blue tail is taken care of by a little belt-type apparatus. He's got new hands and feet in order to show off how different his anatomy is. His blue face has some deep black shadows, hinting at the way in which light passes through him when he's hiding in darkness. His hair and pointy ears are a removable piece. 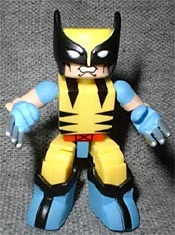 The last member of this set might be the one that most people buy it for: our very first old-style Wolverine. We've got a Ultimate Wolverine and a civilian Logan, but this is the first time we've seen the little Canuck in his classic costume. Actually, that familiar costume is one big error: story goes that Gil Kane drew the mask wrong when he turned in his cover, and that's how it has become imprinted on fans' minds since. Personally, I liked his original mask a lot better: it did a better job of conveying the "Wolverine" name and just made more sense. Bit late to complain about now, huh? In any case, this is the Wolverine that people know - yellow and blue with black stripes on the shoulders and ribs. He's got his big winged boots, which are separate pieces that fit over the standard Minimate foot. His claws are painted flat silver, and his mask can be removed to reveal the angry face beneath. All the Minimates share the same body with different paint decos, and they all move at the same 14 points: neck, waist, shoulders, elbows, wrists, hips, knees and ankles. That's a heckuva lot of motion for something so tiny. This six-pack is the largest selection Minimates sold yet - even the Toys R Us multipacks only had five, and that's counting the bonus figure - and provides a lot of nice new pieces for custom Minimate recipes. The box art is a great Minimatization of the comic's iconic cover; it's just too bad that we still don't have a Classic X-Men set of figures to go with this new team.